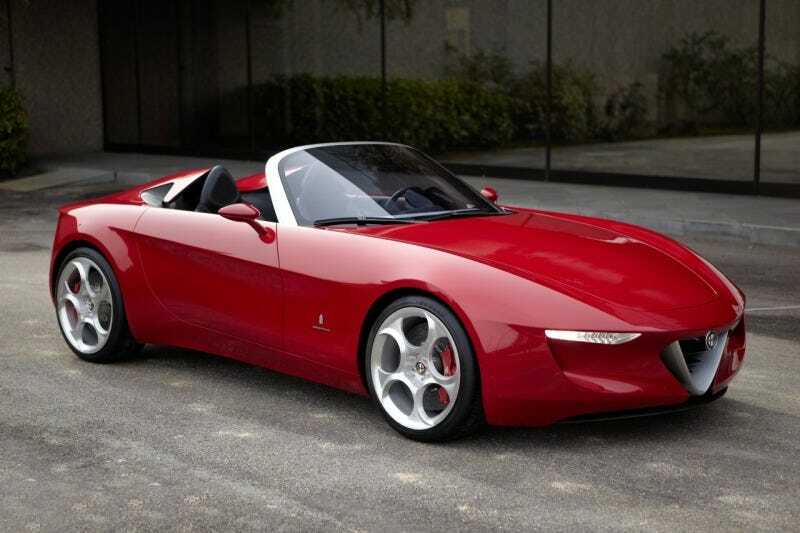 The Alfa Romeo 2uettottanta concept references the Duetto and with power coming from a 1750cc turbo four, it might preview a new Spider production model. We hope it does, because this is one drop dead gorgeous sports car. The Pininfarina-designed Alfa Romeo 2uettottanta Concept is a tribute to Alfa Romeo, which celebrates its centenary in 2010. The aim is to replicate the "passion" of the two brands with the Alfa Romeo 2uettottanta Concept — a clean, elegantly-lined "simple 2-seater", which is proposed with a 1750 cc turbo engine positioned longitudinally, an obvious reference to the "1750 Veloce" of 1968, one of the many versions derived from the famous "Osso di Seppia" (Cuttlefish). With its red bodywork, inspired by the typical Alfa Romeo paintwork, the 2uettottanta is 1797 mm wide, 4212.6 mm long, 1280 mm high and has a wheelbase of 2500 mm. It's also, as we said, drop dead gorgeous.